Very lightweight fabrics such as chiffon can be a challenge to sew on your machine. 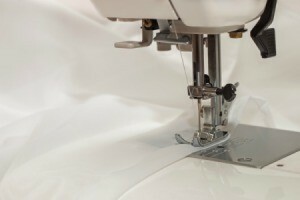 This is a guide about use tissue paper when sewing chiffon. Tissue paper placed under chiffon makes sewing easier! When buying fabric the other day, I remarked how much I hated to sew with chiffon fabric because it's so thin, it sometimes gets pulled into the machine. Well, this gal had been sewing for 50 years and told me her trick: Put one or 2 pieces of tissue paper under the chiffon. This will easily tear off later. I can't wait to try it for any thin, troublesome fabric! Whenever I use a paper backing on a sewing project, I have a difficult time trearing the paper off without pulling the seam thread. Is there a trick to it that I don't know? Yes, you need to use a thin paper like tissue paper so it won't rip the seams. Then just rip it straight down one edge of the seam, the other side should just pull off after that.